Sound baths are devised for groups of people to be immersed in the sounds of Himalayan and crystal bowls, gongs and gentle percussion instruments. The sound bath will last about 1 hour and is a purely passive experience. All you have to do is lie down and let the sounds wash over you. It is a wonderful opportunity to relax and let go in a supportive group environment. A Sound Bath is a wonderful, stand-alone experience. If time is allowed, it can also make a relaxing additional ending to a group voice workshop. Sound Baths take place in a comfortable room or hall, large enough to take the whole group, each lying down in their own space. You will need to bring something comfortable to lie on, a pillow and a blanket. I run a monthly Sound Bath at the Banyan Retreat, near Ashford. Please see the ‘Events’ section or details and booking. 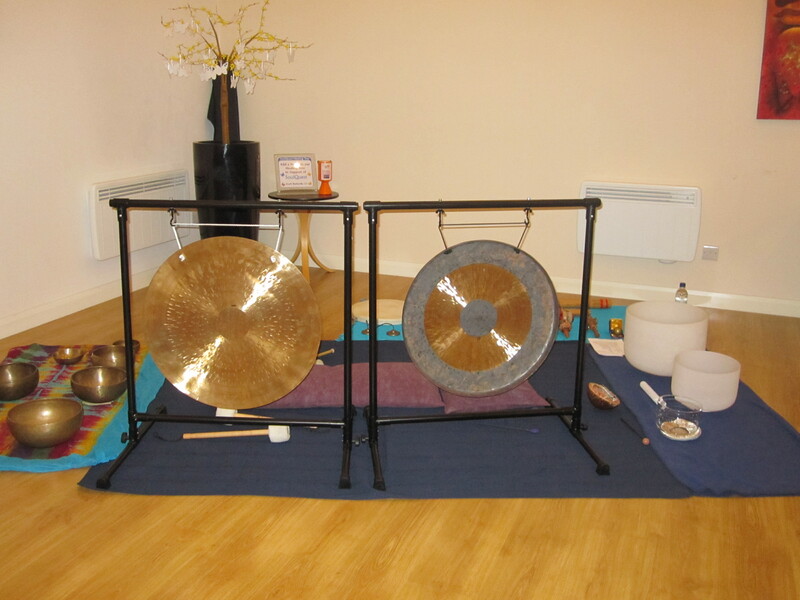 I can also bring a Sound Bath to a venue of your choice anywhere inn Kent or East Sussex. Please email or phone me to discuss details. ‘It was nice to come. It definitely makes me sleep better, with un-school related dreams!’ (Lucy, a primary school teacher). ‘Thank you so much for yesterday. I slept beautifully and feel really happy today’. (Julie, optician and mother of two primary age children).